The Showman’s Show is the biggest outdoor event of its kind, specialising in outdoor events and attracting a wide variety of visitors from all over the world. Over 4,500 visitors attended the event at Newbury Showground over the two days to see over 350 exhibitors showcase the latest innovative event structures, equipment, technology, services and entertainment that the outdoor events industry demands. In an ever developing industry, The Showman’s Show is a great place for event professionals to find new inspirations, ideas and resources to keep their future events up to dated and competitive. This year at The Showman’s Show, our stand was bigger in size which gave us the opportunity to exhibit a larger range of outdoor display solutions to visitors. 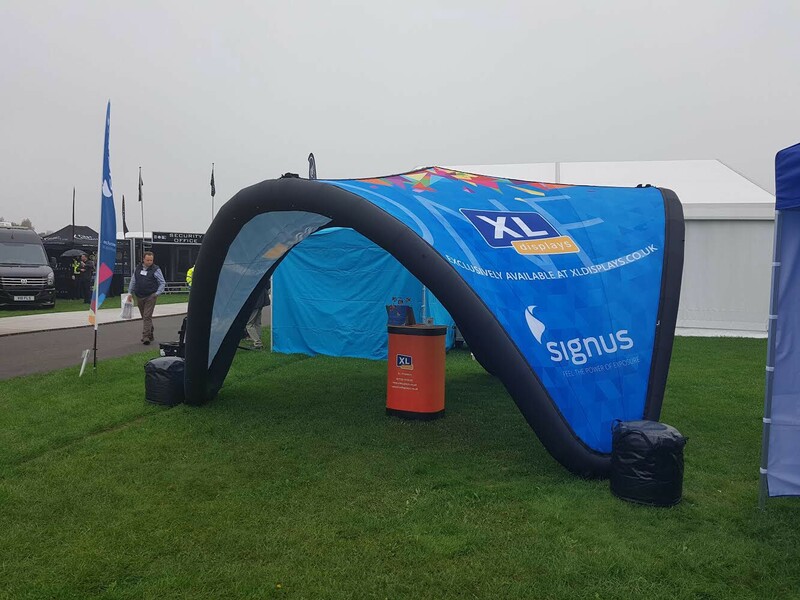 Our stand consisted of our latest outdoor event solutions like the X-GLOO Inflatable Event Tent and Signus One Inflatable Pavilion. The X-GLOO was a tremendous crowd-pleaser and attracted a lot of attention from visitors looking for a new solution for a wide range of different events and applications. The quality and detail of print of the X-GLOO speaks for itself and boasts qualities any event planner looks for in new innovative products – resilience, sturdiness, reusability and limitless marketing potential. The Signus One Inflatable Pavilion was another show stopper piece that turned many heads at the event. This new, innovative product’s unique design and shape intrigued many visitors and event organisers. In the midst of rainy weather, the Signus One stood proud boasting vibrant colour and detailed and made a real impact even on the cloudiest of days. Being brand new to the industry and due to its quick assembly time and impact potential, the Signus One attracted huge interests for a wide range of events. It was a real pleasure for us to present this new innovation to event professionals and witness the great impression it made on event planners. Despite being an outdoor events exhibition, a lot of visitors at The Showman’s Show were interested in our other display solutions like our Bespoke Exhibition Stands range and our popular portable displays such as Roller Banners, Pop Up Stands and Outdoor Displays, as well as our Custom Printed Gazebo that we showcased at the event. Our VR competition was a huge success at the event and saw lots of participants search for the hidden star in our VR experience. It was great to see visitors engrossed in the competition and battle to take first place on the lader board to win an Insta 360 Camera. The winner of our VR competition was Jack Jordan from Telenet Logistics who narrowly beat second place. Well Done to Jack and thank you to everyone who took part in our competition. Thank you to everyone who came to visit us at The Showman’s Show, it was a real pleasure for us to meet so many amazing event professionals and provide solutions to their future event needs. 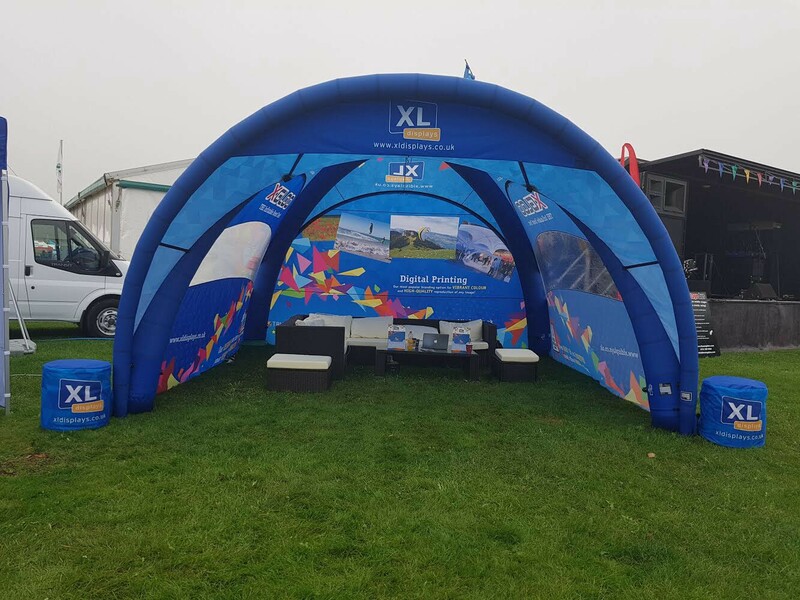 This was the second year that XL Displays have exhibited at The Showman’s Show with an even bigger product range, we can’t wait to see what 2018 will bring to the events industry! For more information on products and services or our time at The Showman's Show, contact us or call us on 01733 511030.